July 24, 2018 By This post may contain affiliate links. Pop some bread in the toaster and spread, sprinkle, or toss on your favorite plant-based toppings. 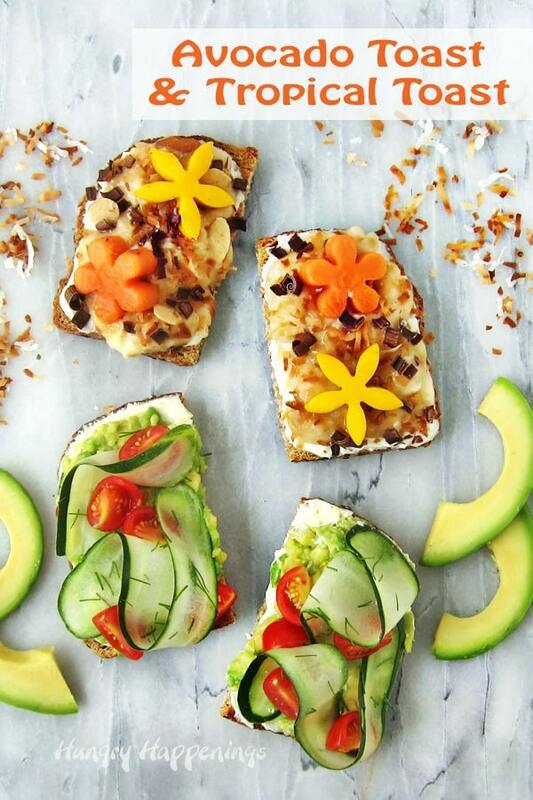 Enjoy savory Avocado Toast topped with Pure Blends Avocado Oil Plant-Based Butter, ribbons of cucumbers, cherry tomatoes, and fresh dill or a sweet Tropical Toast topped with Pure Blends Coconut Oil Plant-Based Butter, bananas, toasted coconut, chocolate, almonds, papaya, and mango for breakfast, lunch, dinner, or a snack. Do you find it challenging to get your family to try nutritious plant-based meals? Around our house, where I’m baking sweet treats several days a week, we have to find a balance by eating healthy meals and snacks. I love munching on raw veggies and fruits, but my husband doesn’t agree that a bowl of carrots and cucumbers with a dollop of hummus constitutes a meal. The creativity I use to make all my fun food crafts comes in handy when making nutritious food that is as visually appealing as it is tasty. Recently I have become enthralled with all the gorgeous toast pictures on Pinterest. Have you seen them? People are topping toast with all sorts of vegetables and fruits, so I thought I’d give it a try too. Thankfully, I recently discovered Pure Blends, a plant-based butter that is made with either avocado oil or coconut oil. Both of these smooth and creamy spreads are available in the butter/spread section at Walmart. These plant-based spreads taste great on plain toast, but when topped with other nutritious ingredients ordinary toast can become an appetizing meal or snack. If you haven’t given toast much thought before, now is the time to have some fun topping your toast. After looking at all the beautiful pictures of toast online I went on a shopping spree through the produce aisle at Walmart. As I picked up each vegetable or fruit, I began to create flavor profiles in my mind. I’m one of those people who loves walking down the aisles of a grocery store, but if you are not, then you can order the items to make your toast online and use Walmart’s Online Grocery Pickup. This service is so convenient especially when you are short on time. I filled my cart with all sorts of items and had so much fun experimenting with different plant-based toast toppings. Some friends stopped over that day and we all enjoyed sampling the different toast, some savory and some sweet. Here are two of our favorites. Start with your favorite vegan bread and toast it in the toaster or toaster oven. Spread on some Pure Blends Avocado Oil Plant-Based Butter. Cut an avocado in half, remove the pit, and scoop out the flesh into a bowl. Sprinkle on a bit of fresh lemon juice. The lemon juice not only imparts a lovely flavor it also helps to keep you avocado from turning brown. Smash the avocado in the bowl and season with a bit of salt. 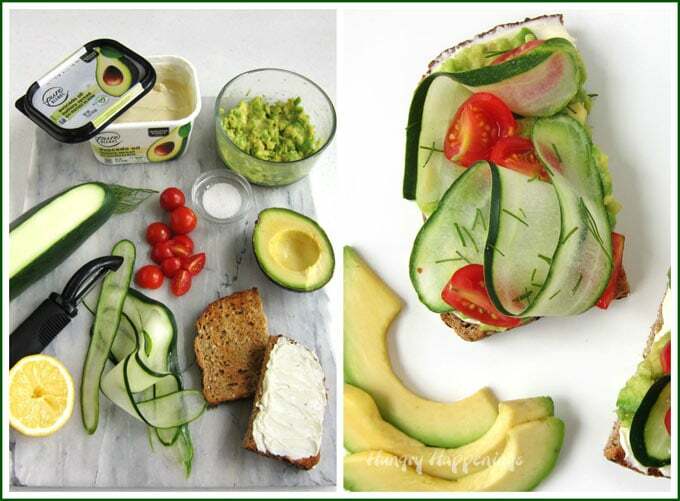 Spread the avocado over your toast. One avocado smashed is enough to cover two large slices of toast or four smaller pieces of toast. Use a vegetable peeler to cut ribbons of cucumber or simply cut the cucumber into slices. Be sure to wash and scrub your cucumber if leaving the peel on it. Drape a few cucumber ribbons over top of the toast. Cut cherry tomatoes into quarters and sprinkle over top. Sprinkle on some fresh dill. A drizzle of vegan balsamic vinegar tastes great over top of this avocado toast (if using, skip the dill). A sprinkling of vegan feta cheese would taste great too. Toast your favorite sliced bread then spread on some Pure Blends Coconut Oil Plant-Based Butter. Smash a banana and spread about half of it over the toast. Sprinkle on some toasted coconut, shaved semi-sweet chocolate, and a few sliced almonds. If you are making this a vegan meal, be sure to choose a chocolate that does not contain any milk. You can find vegan friendly chocolate bars in the candy aisle at Walmart. Top with some papaya and mango. I just love the pretty mango and papaya flowers on this tropical toast, but you can certainly just add slices, if you prefer. To make the flowers, cut slices of the fruit then use a small flower shaped cookie cutter to cut out the shapes or cut out using a knife. Vegan friendly toppings for toast. Spread Pure Blends Avocado Oil plant-based butter over toast. Cut avocado in half, remove pit, and scoop out flesh. Sprinkle on lemon and salt and smash. Spread a thick layer over toast. Add cucumber ribbons, cherry tomatoes, and a sprinkling of dill. Spread Pure Blends Coconut Oil Plant-Based Butter over toast. Spread a thick layer of smashed banana over top. Sprinkle on toasted coconut, chocolate, and almonds. Add slices of mango and papaya or cut the fruit into flower shapes and place on top. I was compensated to create these recipes to share with you but all the opinions expressed here are my own. 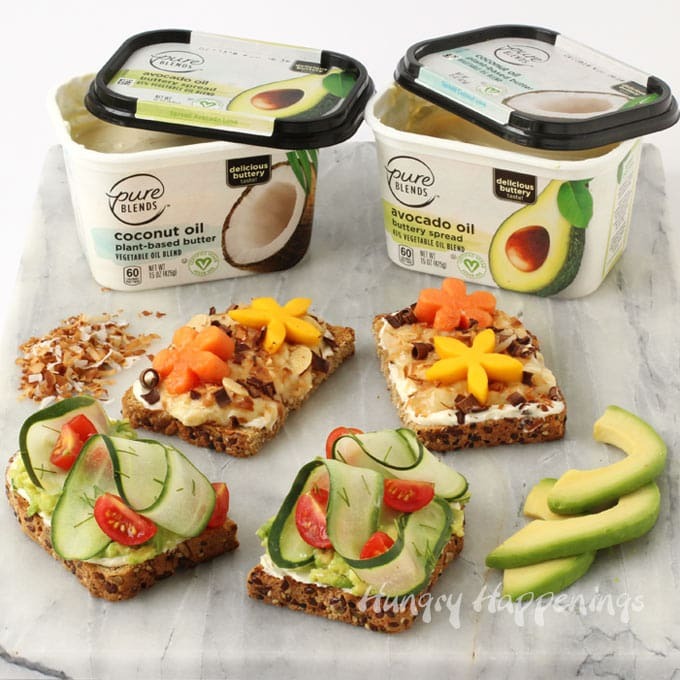 I hope you give the Pure Blends plant-based spreads a try. I’d love to hear in the comments below how you like to top your toast. You can learn more about the benefits of a plant-based diet at PureBlendsBrand.com. 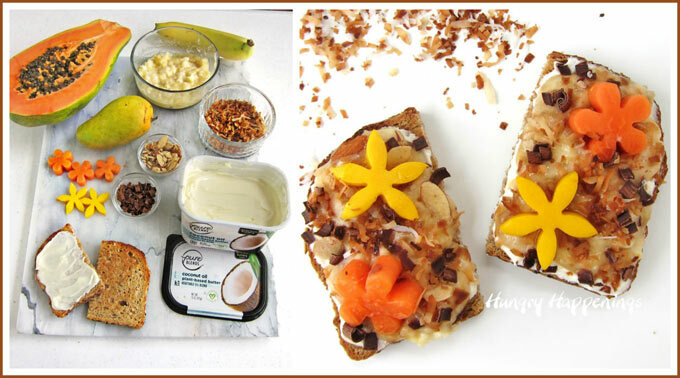 These are the most beautiful tropical toast I have ever seen and they sound delish! Thanks! They were fun to make and eat. Wow, these are gorgeous! Almost too pretty to eat…..almost! Yum!! Yum!! I am obsessed with avocado toast lately! These look fabulous! Love the cookie cutter mangos and papaya! 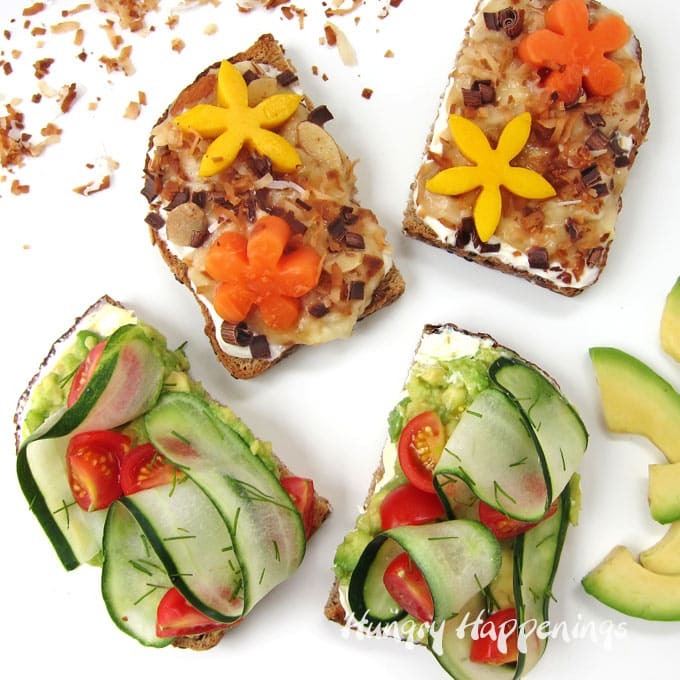 Thanks, I thought the flowers added a nice touch to the toast. What great ideas! These look super yummy!